Software Upgrades: The following issues (marked "BUG") existed in firmware version 1.12 (or before) and were fixed in version 1.13. ISSUE: The WattNode only accepted 29 (instead of the documented 30) human readable characters of text for writable String (device description and device location) properties. ISSUE: WriteProperty and WritePropertyMultiple requests to read-only Communication Error object properties resulted in the UNKNOWN-PROPERTY error instead of WRITE-ACCESS-DENIED. ISSUE: The meter responded to certain WritePropertyMultiple requests, where a malformed request followed a successful write, with an incorrect error code. ISSUE: The meter did not respond with the correct errors for invalid WriteProperty and WritePropertyMultiple requests where the request contained multiple values to be written for a single property. Should You Upgrade? - We recommend that you upgrade if you are affected by any of the listed bugs. Often industrial environments involve adverse conditions that can influence the operation of Ethernet devices. Having designed and manufactured our products with this in mind, we are introducing our new Skorpion industrial Gigabit Switch engineered for demanding conditions. The EISK8P-GT Skorpion Gigabit Switch is a plug-and-play 8-port unmanaged Ethernet switch with features that include Gigabit Ethernet (GigE) performance on all ports and Power-Over-Ethernet (PoE) on four ports. The economical and versatile 8-port unmanaged Gigabit Switch is equipped for exceptionally quick speeds. GigE jumbo frames up to 9216 bytes are supported for maximum system performance. For 10/100 Mbps legacy devices, its port speed automatically slows — accommodating any Ethernet automation system. Our wireless controls reduce the complexity of building management systems allowing installation by non traditional venders such as mechanical or electrical contractors or building owners. MESH_LITE, with its browser based front end is scalable from a single zone to hundreds of zones. MESH_FULL is an extension of our wired “Walker” control systems and offers a full range of standard BMS features including graphics, programmability, scheduling, trending, lighting control and alarms. A range of vibration sensors and monitoring techniques are now available that can help engineers detect and manage vibration, and thus extend the operating life of automated machinery beyond recommended maintenance intervals. 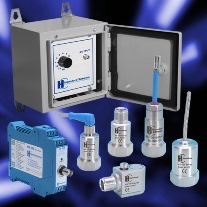 Mounted in a number of key positions on mechanical equipment, vibration sensors offer the potential for continuous monitoring and analysis, an inexpensive option when balanced against the potential cost of downtime on an automated line, and when condition monitoring measures are in place to detect factors such as vibration, machine downtime can virtually be eliminated. Crestron announced that AirMedia, its all-new wireless HD presentation and collaboration solution for any meeting space is now shipping. With AirMedia anyone can walk into a room and wirelessly present PowerPoint®, Excel®, Word and PDF documents, as well as photos, from their personal iOS® or Android™ mobile device on the room display. MacBook® and PC laptops can be connected seamlessly, as well, making presentations from almost any device fast and easy. DENT Instruments, a global leader in the design and manufacture of power and energy measurement instruments, announces that the PowerScout 3 Plus Power Meter has been certified by independent testing labs to have met or exceeded equipment interoperability guidelines of one of the industry’s leading standards agencies, BACnet Testing Laboratory (BTL). Ideal for new construction or building recommissioning, the PowerScout 3 Plus instruments are dependable single-point submeters for precise energy measurement. Paired with flexible and easy-to-mount RoCoil CTs or traditional split-core style CTs, the DENT PowerScout provides accurate and cost-effective energy measurement for a wide range of building submetering projects. The DIDO Pro is an extremely compact and powerful, multipurpose video processor. It is a high resolution, quad image scaler with the ability to rotate the displayed image windows in ninety degree increments. DIDO Pro can show up to 4 high resolution/full motion images on a single display with great flexibility in any format. Up to 6 inputs can be selected using the included IR remote or serial control with Aurora's WACI NX or other high end control systems. Store up to 99 presets and link together multiple DIDO's for control via a single RS-232 port. ControlMaestro 2013 is the latest version of ELUTIONS' SCADA solution for the automation, control-command, and monitoring of facilities/technical infrastructures to improve their operational performance. The new ControlMaestro 2013 version obtained the BACnet Advanced operator WorkStation Certification (according to the BACnet 09) corresponding to the highest level of compatibility recognized in the market. With more than 160 standard communication drivers available, ControlMaestro allow bidirectional communication between heterogeneous equipment (even from different generations), and offers an open and extensive interoperability. Most standards and communication protocols, including OPC, Modbus, SQL and ODBC, are supported. Crestron announced its new 2-Button Wireless Keypad (HTT-B2EX-BATT), the latest addition to its line of infiNET EX® wireless lighting control products. Available in black or white, the HTT-B2EX-BATT is battery-powered, portable and designed to control a wide range of applications, including as a bedside controller in homes and hotels, a personal workspace controller, or a conference room presenter selector. The new wireless keypad is sleek, lightweight, and elegantly contoured to fit comfortably in hand. Whether placed on a nightstand or end table, or tethered to a lamp cord, the HTT-B2EX-BATT provides simple, convenient, reliable touch control of lights or shades. Lascar Electronics has launched a thermocouple version of its popular EL-WiFi series of remote data loggers. Supplied with K-type probe, the EL-WiFi-TC has a measurement range of 0°C (32°F) to 400°C (752°F), accuracy of ±1.5°C and display resolution of 0.1°C/F. The sensor can accept user selected J, K, N and T-type thermocouple via its on-board mini thermocouple connector pushing the potential measurement range to -270 to +1300°C (-454 to +2372°F). During initial configuration, the sensor will search for an existing wireless network while physically connected to the PC via USB cable. Once connected, the user can use the software to name the sensor, select sample rates and set high and low alarms. It can then be unplugged and placed anywhere within range of the WiFi network. All future configuration of the unit can be done remotely. Available now, the new line of Crestron LED Drivers provides high-power LED lighting with deep dimming to below 1%. Available in 50W and 100W models with DALI® or 0-10V control, GLD-LED drivers offer superior, smooth dimming technology using a combination of duty-cycle and current dimming. All 50W models are available with two output channels while all 100W models are available with four output channels.